Next up on our album manoeuvres we head back up to Sheffield. "Hiem" are back with their 3rd album! Next up on our album manoeuvres we head back up to Sheffield. 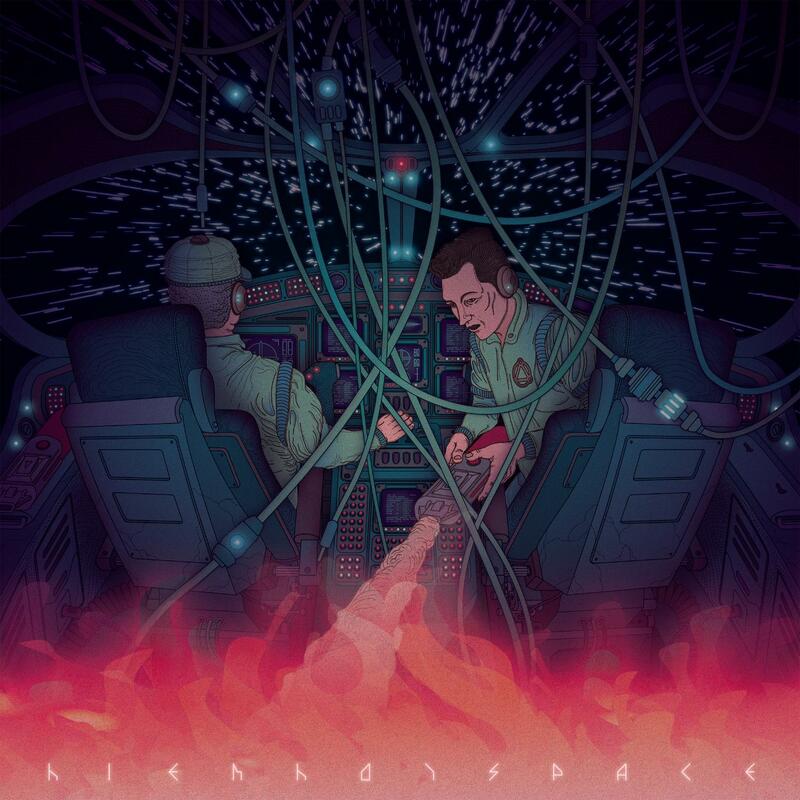 "Hiem" are back with their 3rd album, the galactic cornucopia that is "Hotspace". It is a fine follow up to the 2013 "Escape from Division Street" released here on Nang. "Hiem" consist of dynamic duo of Nick Eastwood & Bozzwell (he was the live vocalist for "The All Seeing I" who scored a worldwide hit with "The Beat Goes On" in 1998). We have always thought of Hiem as one part grown-up dance pop, one part fine 80's tinged songs and one part slightly weird and quirky. The third album doesn't disappoint managing to cram all those descriptions (and more) across ten fine songs. Things open up with the recent single, the high fashion disco stomper "High Life". Pure Nang sound distilled down into one song. Driving bass, snaking sax and snazzy keys. Next it is a breather in the form of part one of the "Hotspace" song quadrilogy. Part one is a sombre scene setting piano piece sounding like a long lost Eno B-side from 1978. Next things kick off with the sparking night time shimmer of part 2, "Hot Space" itself. Percussive bass guitar and shimmering guitar wrap around the sci-fi themed tour de force. Keeping things stratospheric we next slow things down for some sub-orbital slow-synth grooves with "Oxygene". To close off the Hotspace segment "Telepath" looms large with its pending-alien-invasion groove and slow pulsing basses. After a quick flip of the vinyl we slip and slide with a slow snaking groove of "My Evil Friend". Channelling some 10cc Dreadlock groove the pair next give us "That Girl She Made Me Cry". On every Hiem record there is a that section of light relief. This time "Monkey Office" fills that space with a cautionary tale of 9-to-5-ism. To close off the album first is the Bowie-esqe low minimalism of "Gortlizer Park" and the slow perc-groove funk of "Sign Of The Times". Album three, locked and loaded. All songs written & Produced by Hiem (David Boswell "Bozzwell" and Nicco Eastwood). "Sign of The Times" Engineered & Mixed by Robin Downe. Vocals & Keys by David Boswell "Bozzwell" & Nicco Eastwood. Drums on "Highlife" by Andrew Stenton. Guitars by David Boswell "Bozzwell". Art cover & Graphic design by David Imbernon.